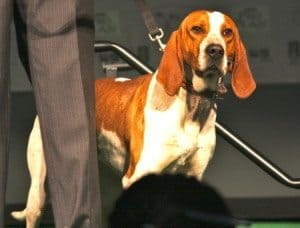 The American English Coonhound has the attitude, strength, grace, endurance and speed of a seasoned athlete. He can hunt raccoons and foxes all night and trots around with very little effort. His medium length, protective coat is hard and can be white and black, white and red, blue and white ticked, multi-coloured or white and red ticked. He is descended from the Virginia Hounds which were bred for rough terrain. They were descendents of the English Foxhounds. This dog needs lots of activity and exercise to stay in shape. His coat only needs minimal attention. He’s confident, alert, pleasant and very friendly with people and other dogs. His height is 23-26 inches.